I'm new to tomatoe growing. I'd like to grow Rutgers tomato because that's what my dad grew and they were awesome. It will have to be in containers because it will be on the roof of a houseboat. I've got a number of basic questions and wondering what different ideas people have about them. I'm planning to use Miracle Grow potting soil, and so far planning on watering with Miracle Grow for tomatoes once a week. Since other waterings will wash out some of the plant food, should another type of fertilizer that breaks down more slowly (or whatever...I don't understand those types) be used in addition to that weekly feeding? Will the type of fertilizer have much influence on the flavor of the tomatoes? Does it matter much whether or not the leaves are wet from time to time with food like Miracle Grow? As long as the container is 16" across and about that deep, will that be big enough or would there be much difference in using something larger? I've read that it's good to sprinkle oyster shells on the ground to add calcium. Is that a good thing to do and if so do the shells need to be replaced, or more added, over time? Also I read it's good to cover the dirt with grass clippings to both add nutrition and help retain moisture. Is that good advice? Should any mulch be added, and if so how does that work? How often to water and does it matter much what time of day? Should the plants be let dry to the point of wilting a bit from time to time to keep down the chance of root rot and/or whatever else? Are there timer/solenoid valve combinations that are set up for standard hose fittings, or anything like that to make automatic watering easy? Is it best to have water run over the plants when watering them like when they get rained on, or does it matter much at all? I have both lake water and county water available. Does it matter much which type is used? From my pov suckers often seem to be more of a branch than the larger leafy things below them, and it seems like it might be better to pinch off the leafy thing below the suckers and let the suckers develop into branches. Is there any value in persuing that thought, or is that a completely wrong interpretation? From what I've read so far it seems most people feel that it's wrong, but they look more branchy than the things below them to me for some reason. What do you folks in general suggest we prune, and top off, etc? Should all yellow and spotted looking leaves be removed? If most of the leaves on a branch are yellow and spotted, should the entire branch be removed? Can anyone suggest some good websites where they clearly show how the plants grow and why to prune what, and when? Thank you for any help with these questions! let me give you some advice - get the biggest containers possible! And get the deepest ones too. The deeper the container, the better looking the plant. See those black containers? They're 5 gal, but they're not deep enough, so the plants in those containers are pretty root-bound and lack growth. Get the biggest and deepest containers you can get. Soil: I never use Miracle grow, I grow everything organically and I amend my own soils. That takes some research and time-testing, but if you're interested in my recipe just let me know. MG will work - my mom has two better boys plants in MG soil and they look good, but they don't produce as much fruit as my organic plants do. In terms of taste - I think most folks around here will agree that an organically grown product normally tastes better then one using chemical ferts. But to each their own. Because MG soil comes pre-loaded with a lot of food in it, you may not need to feed with every water for a few waterings. Watering can be tricky. There isn't one formula to when, how much, how often, etc. It's all based on conditions. My rule of thumb - if the soil feels dry when you stick your whole index finger down to the knuckle, then water. Water deeply. With that being said - due to the high temps I water my container garden almost everyday. So your localized conditions have a huge impact on how often you water. If a plant looks droopy, I'll water it for sure. Trimming/pruning - I don't trim any suckers, I don't top. I only trim bad looking branches, ones that are burned up, brown, etc. Some people to trim and prune, but I don't. Everyone will have their own methods and opinions. I hope mine help you! Thats two plants in one BIG container (not sure of the size - maybe 10 gallons?). It's thriving. It's my best container plant(s). Remember - bigger is better! DownriverGardener wrote: Soil: I never use Miracle grow, I grow everything organically and I amend my own soils. That takes some research and time-testing, but if you're interested in my recipe just let me know. MG will work - my mom has two better boys plants in MG soil and they look good, but they don't produce as much fruit as my organic plants do. In terms of taste - I think most folks around here will agree that an organically grown product normally tastes better then one using chemical ferts. But to each their own. Because MG soil comes pre-loaded with a lot of food in it, you may not need to feed with every water for a few waterings. Watering can be tricky. There isn't one formula to when, how much, how often, etc. It's all based on conditions. Thank you for your help. I'm interested in what you use for soil, even if I end up using MG instead. Since organic means it contains carbon pretty much everything seems like it must be organic to me, so I'm interested in how you make a distinction. I'd also like to learn some basics about how plants function. It seems like they collect nutrients during the day, and then build with them at night or something like that, and if so that would probably have an influence on when is the best time to water them. If I want to start some from seeds in the spring, when should I start trying to grow them inside? January, maybe? Unlike the chemistry definition Organic=contains carbon, gardening definition of "organic" matter is usually dead (and often already composted) plant matter and herbivore/insectivore (most livestock) manure. Growing "organically" means not using chemical fertilizers, pesticides, nor herbicides. Most people start by making compost from kitchen scraps and other household wastes -- most notably paper products and yard and garden waste such as grass clippings, fall leaves, hedge trimmings, weeds, spent vegetable plants, etc. If you haven't started a compost pile already, you might want to peruse the Compost Forum discussions. Yeah, in gardening organic basically means natural, produced by nature, not laboratories. No petroleum products, no synthetic fertilizers, no poisons, etc. Re when to start tomato seeds indoors, 8 - 10 weeks ahead of your last frost date. I looked it up, last frost date in Atlanta, GA is listed as 4/10, only about a week earlier than me. So somewhere between the first of Feb and Valentine's day would be good for you. You don't want to start them too early or you will have big plants that outgrow your space and get leggy, etc. Before you start, do some reading in our Seed Starting Forum. There is some technique to it and some basic equipment (lights!) needed. People often end up disappointed, if they think they can just buy a seed starting kit and set it on a window sill. It is not difficult once you know the basics. DownRiverGardener-I'm interested in you recipe for containers. Can you post it? I just obtained 5 very large containers. I'm not sure about gallons, but they're 18" high and 20" diameter at the top, a little narrower at the bottom. I'm hoping to grow 2 tomatoes in each pot next year, but figured I should start the soil this fall. This was my first year for container tomatoes. I still have a lot to learn, but here are some items I know of for now. 1. Yes, on the bigger the container the better. I tried different sizes. The best ones I have came from neighboring farmers--tubs that contained some mineral supplement for cows. 2. Watering is tough. No matter how big the container, the soil dries out on all sides. I tried soaker hoses, overhead sprayers, but only survived with daily or evrery other day watering. 3. Containers do better if not in the sun all day long. Some of my containers were shaded in the afternoon by a row of corn. Those plants have done much better. 4. Some of my plants, the ones in too much sunlight, got a bronze color to the end of the leaves, began to wilt a bit, and the tomatoes has yellow shoulders. Research told me that was due to too much sun, and the roots hitting the hot sides of the containers. These were helped with miracle gro watering, some 15-0-15, and I even put some shade over this row of plants. 5. 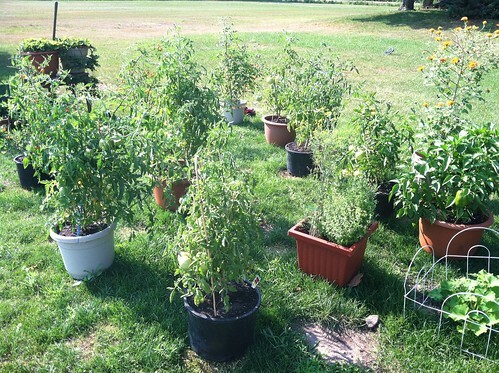 Verdict is still out on whether the container tomatoes will last on into the fall. Some of the plants have bit the dust, and others have some good green growth at the top, lots of blooms. But this is the same with the plants in my regular garden....some dead, some with promising growth. 6. Next year I will add Calcium, because Blossom End Rot was a major problem early on. All in all I made a lot of tomatoes, both from containers and from the rows in my garden. Always learning, and I look forward to more posts to your thread. 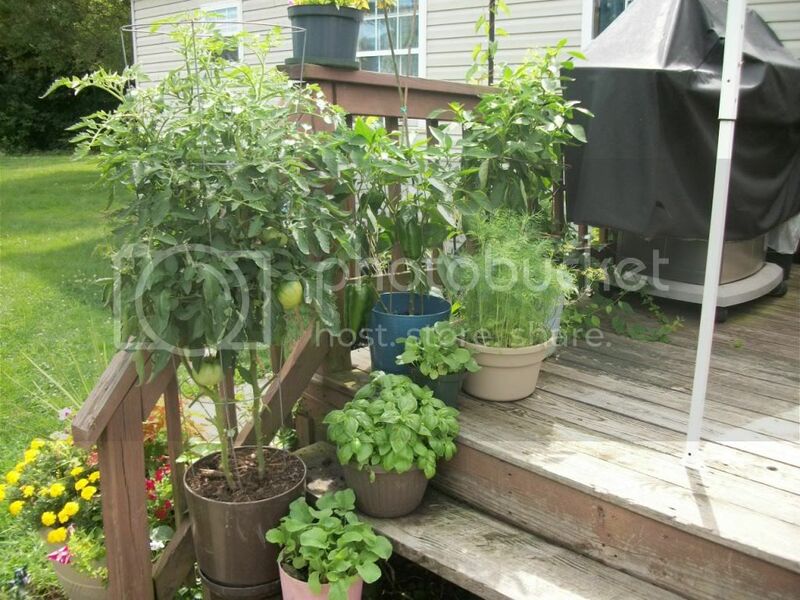 Hello, I also container garden on my deck, I use miracle grow potting soil, then fertlize with tomato tone over the season, I water just about everyday. I also only take off the dead branches as the season goes on. I think I get pretty good results and usually the containers are topic talkers while enjoying an evening with friends.. I also have a ground garden, but enmjoy haveing a bit more color on the deck also. Hi and thanks to everyone for posting this very interesting thread. I, too, am interested in container growing tomatoes, and other stuff as well, in a greenhouse up in Zone 3, the land of extremes. Outside in the ground doesn't work well for us because of native grasses and stupid weeds (creeping jenny mostly!) Oh, not to mention weather, wind, bugs, etc. etc. etc. So we are going with containers in a raised greenhouse (that story and most of this is in my intro.) I will keep looking for more threads like this! taradal wrote: DownRiverGardener-I'm interested in you recipe for containers. Can you post it? I just obtained 5 very large containers. I'm not sure about gallons, but they're 18" high and 20" diameter at the top, a little narrower at the bottom. 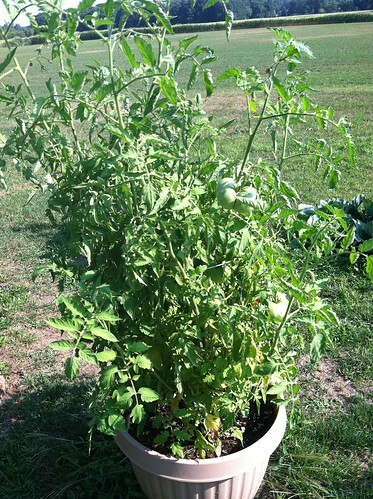 I'm hoping to grow 2 tomatoes in each pot next year, but figured I should start the soil this fall. -40% of some sort of organic material. Compost works fine, but since I didn't have any compost ready this growing season, I bought a tong of bags of Scott's Earth Gro Composted Hummus and Manure. It's very cheap, like $1.20 a bag a The Depot or Lowes. -20% Perlite so that the containers don't get compacted, and so they drain well. Aside from those ingredients, I also mixed in a massive amount of organic and natural "dry"/"dusty" food, example: Jobes Tomato food. Nope, a little bit of compost in it, mixed in with potting soil etc. Real dirt unless your soil is very sandy, tends to be too heavy and dense for containers. Sits there and turns into a brick.